Here’s why these buyers got moving (again). NEEDS CHANGE AS life goes on. Suddenly, there are queues for the bathroom, and figuring out kitchen storage becomes like a game of Tetris. Upgrading or upsizing to a bigger home brings more space, sure, but it can make life easier in more ways than that. We talked with five homeowners who recently upgraded to a new place for a range of reasons: from a garden for feline friends to better facilities for a disabled family member. 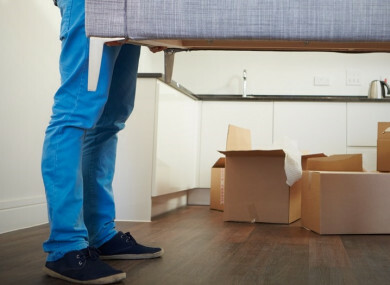 Here’s why these five couples decided to make the move – and how they dealt with the process of house-hunting for a second time. We were unhappy with the lack of community. It was a big housing estate so everyone was very transient and just came home went to work and home again. We wanted to be part of a community and have an input into our environment. After searching for over a year and viewing fifteen properties, Triona and Séamie were outbid on two properties and an additional one mysteriously fell through. The standard of living is better for us. We have gotten to know our neighbours better here in just six weeks than we did over four years in our last home. Dubliner Laura and her Australian partner Patrick made the jump across the Liffey in order to accommodate their growing family: Jack, 13; Henry, 3; and Failey, 2. Specific space needs for Jack’s wheelchair and medical equipment meant the couple had already knocked a wall in their Dublin 24 bungalow. But they dreamed of a place with better facilities inside and out. The bungalow just didn’t fit us all, and the area we were living in wasn’t great for children. It was a concrete jungle. I had a simple dream of being able to walk out of our house with Jack in his wheelchair and go to the park, a coffee shop, a friend’s house. Laura and Patrick originally envisioned building their own home outside of Dublin, and “planning a house around Jack and his wheelchair.” But in the end, the convenience of city life sent them closer to the centre, rather than further away. We now have seven bedrooms which are always full. We constantly have family staying or friends. It’s truly amazing to be able to fill your house with life and the laughter of the people you love. When Sinead Starrs started a new business selling wedding accessories, she and her partner Owen Reynolds found they suddenly needed more space to than their two-bedroom apartment in Dundrum could afford. So far, Sinead says the sacrifice of moving further out of the city and compromising on her dream home has paid off. Having a dedicated office area certainly helps me to keep focused when working from home and separating ‘home life’ from ‘work life’. Plus we gained a garden, which meant space for a dog – our cocker spaniel! After they got married, Sarah-Joy and Stephen Hearty lived in a tiny, one-bedroom granny flat in a seaside Dublin suburb. A dream of mine was always to have a house big enough to host comfortably and be able to provide friends and relatives a place to stay, something we couldn’t offer in our last place. This summer, the pair moved from a rented one bedroom apartment in Dublin to a four bedroom detached house in Sarah-Joy’s hometown of Athlone. The transition hasn’t all been smooth sailing, but Sarah-Joy says she has no regrets. Between changing location, moving away from one side of the family, leaving a job that I adored and adjusting to life back in my hometown, there have definitely been a few adjustments. But in the midst of it all, there’s an excitement and real sense of adventure. After twelve years in a 450 square foot flat in Stoneybatter, Dublin 7, Kirstie McDermott and Neil Williams were finally able to get out from under their pre-crash mortgage and move to a bigger space. A decade later, deposit saved, they started looking again with two key parameters set: a house with space and room for pets inside. I was desperate for cats, I felt like I’d been waiting my whole adult life to get my own cats and I wasn’t going to compromise. We were buying a house and that was that. While they weren’t looking for a house that needed renovating, they fell in love with a Victorian villa in Phibsboro. The couple ended up having to put in a new bathroom, doors, floors, roof, electrics and insulation before the house was even livable, and the projects continue. But while they had been reticent to take on such a commitment with busy work schedules, the house (and cats) have proved to be just what they wanted. I think we both get a sense of accomplishment when we get something new done. Little by little we’re picking the house up by its bootstraps. Email “'We always have family staying': 5 homeowners tell us why they upgraded to a bigger place”. Feedback on “'We always have family staying': 5 homeowners tell us why they upgraded to a bigger place”.